Trying to capture the history and tradition of the Troopers in a single go can be a herculean task. 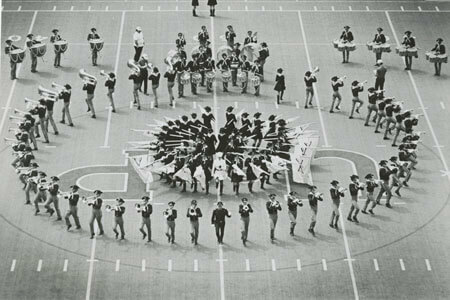 They've had two documentaries and multiple volumes of drum corps history chronicle their accomplishments, their rise into national prominence from humble beginnings on the plains of Wyoming. And yet, it seems that there's always more to say about "America's Corps." And once again, this season – their 50th anniversary – is set to go down as a year for the Troopers' history books. It's always been apparent that the "Long Blue Line" is made of stern stuff, but their return from inactivity in 2007 showed that the revitalized Troopers organization was committed to entertaining audiences, providing a great experience for the corps members, and making sure that the Troopers live long into the future. It was something best understood when seen in person, the corps' classic "sunburst" drill formation saying more than any press release or news update ever could that, "The Troopers are here to stay." The Troopers' signature 'sunburst' drill formation, appears again in their 2008 program. Now, in their second year back on the field, the Troopers are having their best competitive season in more than a decade. They look to be a contender for the World Championship Semifinals competition, gaining momentum with their program, "The Iron Horse Express." The program evokes images of the Old West, the rise of the steam locomotive and the opening of the frontier to the world. Adam Collins, a first-year marimba player for the Troopers, said, "When you hear the show, it's not so much just about a train, it's about a train ride. A lot of it's about belief. It signifies what the Troopers are. We were out in 2006, we came back last year, and this year we're much stronger than we were last year. We just have to believe in ourselves." "It's about taking the audience through the past of the Troopers," said Alex Simpson, a timpanist and a native of Cheyenne, Wyo. "You take the train from what you feel like when you first see the Troopers and come full circle, all 50 years, with 'Ghost Riders in the Sky' at the end. It's a lot of fun. It's a great show." 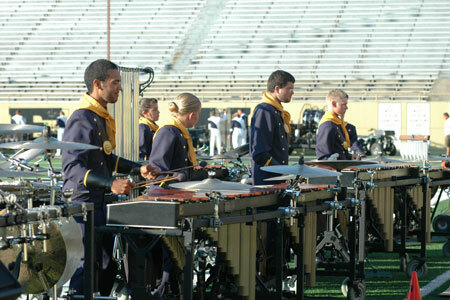 Members of the Troopers front ensemble performing in Kalamazoo, Mich. The Troopers' motto is concise and powerful: "Honor, Loyalty and Dedication." It's evident speaking to the members of this year's corps that they want to live it. For a rookie Trooper like Simpson, this summer season is a dream come true. Simpson said, "I'm a third generation Trooper because my uncle marched, my parents marched. I've always wanted to do this ever since I was 10, and so for six or seven years I've been working really, really hard. I finally made the corps, and it's just everything I expect and so much more. You can't get an experience like this anywhere else." Front ensemble member Joe Kim said, "We all knew that this was going to be a great 50th year. Every time that I go onto that field, I just feel everyone in the crowd knows that we are 'America's Corps.' The score doesn't really matter, it really comes down to how the crowd responds to us. And when we hit that 'sunburst' ... they just stand up and roar and it's unbelievable. And that's the reason why I I wanted to be a Trooper." "I'm actually a second-generation Trooper," said Tory Donahoo, also a member of the front ensemble. "Everything that the Troopers stand for has been given to me every single day since I've been here. I marched somewhere else last year and there's more pride in this one corps than I have ever felt anywhere else. This place is like my family now, definitely. I really can't see how anybody can march anywhere else. It's probably the best thing I've ever done." "Honor, Loyalty and Dedication." With 50 years of momentum building behind them, the Troopers are barreling down the track toward Bloomington, Ind for next week's World Championships. They'll make their fans, alumni, and supporters proud, not because of a score or a placement but because the young men and women of the 2008 Troopers truly have embraced their identity as "America's Corps."